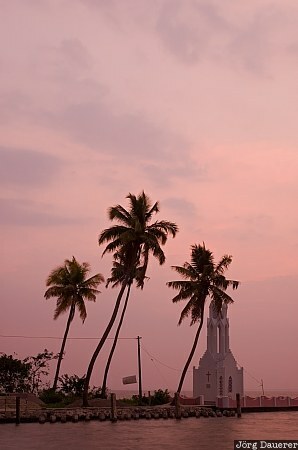 A church and palm trees in Kumarakom on the shore of Vembanad Lake at the backwaters of Kerala at sunset. Kumarakom is in the western part of Kerala in southern India. This photo was taken in the evening of a humid day in February of 2011. This photo was taken with a digital camera.